Foodie news roundup for the week of August 20. 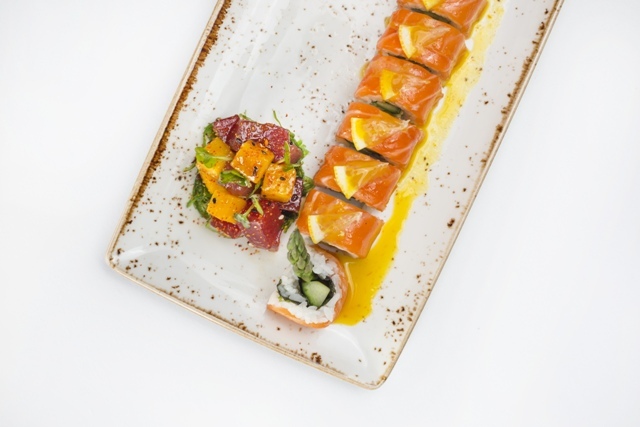 Ocean Prime has introduced its new Sushi Duo (pictured) for $27, featuring a sake-cured salmon roll with avocado, asparagus and cucumber with lemon and spicy yuzu vinaigrette and the ahi tuna poke with sweet mango, daikon sprouts, togarashi, cilantro and toasted sesame seeds finished with a sweet-and-spicy soy vinaigrette. Now through Friday, Aug. 24, Hand Cut Burgers & Chophouse in Scottsdale is offering students a free appetizer. No purchase is necessary–just show your school ID. Chef Tomaso Maggiore at Tomaso’s hosts a four-course wine-pairing dinner, A Night in Sicily, on August 25. The reception begins at 6:30 p.m. and dinner is at 7 p.m. Cost is $80 per person and does not include tax and gratuity. To make a reservation, call 602.956.0836. Wednesday, Aug. 29, is National Lemonade Juice Day, and both Luci’s at the Orchard and Luci’s Healthy Marketplacewant to celebrate by offering a lemonade fundraiser with all of the proceeds going to local school, New Way Academy. Tempe-based business, Sun Orchard Juicery, is donating the lemonade for the day, it will be offered from open to close for $5 per glass of 8 oz. lemonade. Those who purchase a glass of lemonade will be entered to win a Luci’s gift card, hat and shirt. To celebrate the late-summer prickly pear harvest, The Boulders Resort & Spa’s restaurants and bars have incorporated freshly-harvested prickly pear fruit (and its tart juice) in everything from breakfast syrups and glazing to the signature prickly pear smoothies. Try the Cactus Heart cocktail and Spotted Donkey’s prickly pear and lime mousse dessert, among other delicious drink and dishes. Press Coffee has debuted new The Cold Brew Shakers, which are gluten free, dairy free and soy free “mocktails” that show off the rich flavors people love in the drink: peanut butter, chocolate and chai. They are $5 and now available at all Press locations. On Monday, Aug. 27, customers can enjoy Fired Pie’s menu items while supporting a good cause. On that day, Fired Pie will be donating 10 percent of sales at all locations to the Phoenix Children’s Hospital. On Monday, Aug. 27, at Fitz’s Supper Club 2018, Celebrities at YOUR service for First and Ten, the Larry Fitzgerald First Down Fund celebrates 10 years. Attendees can enjoy an array of eats prepared by Chef Marc Lupino,cocktails, spending time with old and new friends, all while bidding for a cause on dazzling items in the highly-anticipated silent and live auctions. The event will start at 7 p.m. and tickets start at $850 per person.